BRUSSELS, 29 February 2012: Intensifying their support to authorities to fight alcohol misuse, Europe’s 3,500 brewers launched a Pledge at the European Parliament on Tuesday to increase consumer information, enforce responsible advertising and conduct new awareness campaigns reaching out to young adults, drivers, and pregnant women. The European Beer Pledge, launched at an event hosted by the EP Beer Club and Parliament Magazine, is a package of voluntary initiatives that Europe’s brewers are taking, which empowers EU citizens and leverages the importance of new technologies such as social media to support the European Union and its Member States in their Strategy to reduce alcohol-related harm. The European Commission’s Despina Spanou, Chair of the EU Forum on Alcohol and Health welcomed the Pledge and Europe’s brewers’ ongoing commitment to the EU strategy and the Forum. She said that of the 212 commitments to the Forum, over one third has been made by Europe’s brewers. “This is quite impressive and one has to acknowledge it,” she said. Highlighting the role of voluntary approaches, Spanou added “Sometimes through voluntary approaches you can achieve a lot and faster than if you went the legislative route. Also because you have the capacity with multi-stakeholder approaches to adapt to national specificities”. The Pledge will be evaluated annually to allow for ongoing measurement of initiatives in line with best practices. Implementation activities may be submitted as actions under the EU’s alcohol-related harm strategy through commitments to the Alcohol and Health Forum. It is hoped that they will provide input to strategies against alcohol misuse at national, regional and global levels. 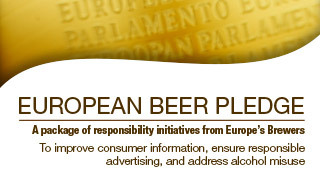 To highlight that the Pledge is about action, The Brewers of Europe submitted a commitment to the Forum today entitled ‘Self-regulating beer advertising across social media’. The commitment, which the Commission will make publically available shortly, will help to ensure responsible beer advertising on social media. Already the brewers associations of Belgium, Bulgaria, Czech Republic, Cyprus, Denmark, Germany, Italy, Malta, Poland, Portugal, Slovakia, Spain, Sweden, the Netherlands and the UK have submitted their planned activities to support the Pledge’s implementation, through concrete, local activities in 2012. The European Beer Pledge is a voluntary initiative by Europe’s brewers to support EU Member States in reducing alcohol related harm. Brewers commit to taking concerted and measurable action to improve consumer information, ensure responsible advertising and address alcohol misuse in line with the expectations of citizens and EU policymakers. Increase consumer information and knowledge through a range of platforms including new technologies. 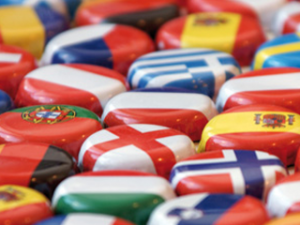 For more than a half century The Brewers of Europe has been the Brussels-based voice of the European brewing sector towards the European institutions and international organisations. Founded in 1958, it has 28 members, comprising 24 national brewer associations from the EU, Croatia, Norway, Switzerland and Turkey. Among the roughly 3,500 brewers across Europe, the vast majority are small and medium-sized, local and family-run businesses. 2 million jobs are created by the European brewing sector. The EU Alcohol and Health Forum is a platform where organisations active at European level can debate, compare approaches and act to tackle alcohol related harm. To become members of the European Alcohol and Health Forum organisations must meet certain requirements and make one or more specific commitments for action. The Brewers of Europe is a founding member of the EAHF and brewers have filed over a third of the 200+ commitments to action.